Jean Ricot Antoine, or just Ricot, is the owner-operator of a transportation business in Port-au-Prince and runs a small fleet of trucks, carrying raw material from the mines at Laboule to a refinery plant for processing into concrete and construction materials. He is also involved in a project that will fund a water truck to sell potable water to residents of the region, and use the profits to provide clean drinking water to an orphanage in Port-au-Prince. In addition, Ricot has dual citizenship in the United States, having lived in Georgia and Miami, Florida — operating a similar business there for several years. A self-described “hustler” and businessman, Ricot is charismatic, open, and willing to challenge conventional ideas. 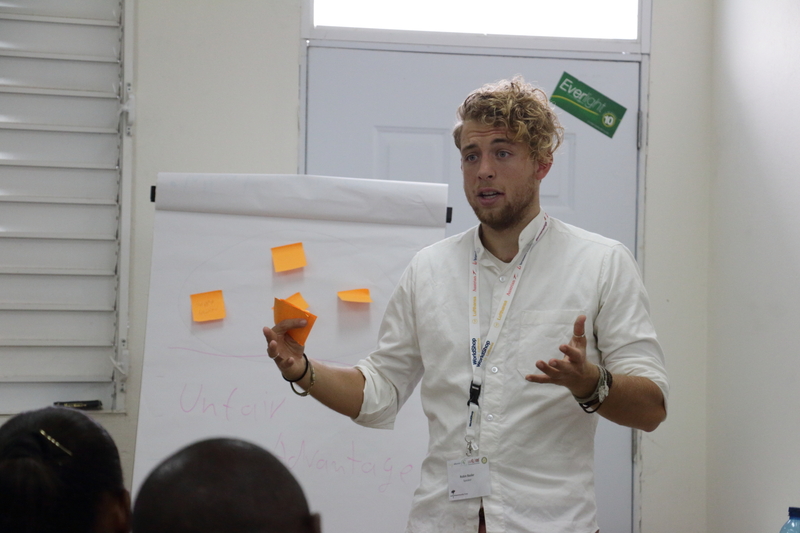 Ricot is attending the Entrepreneurship Camp to gain a better understanding of how to legitimize and grow his existing businesses, as well as branch out into wider markets. He is in the process of incorporating his business to that end, seeking greater financing and a larger team to work under him. He had a strong interest in today’s topic of strategy, and in particular would like to continue to learn about concepts such as SWOT Analysis — Strength, Weakness, Opportunity, Threat — to improve his business chops. This entry was posted in Uncategorized on June 5, 2014 by Entrepreneurship Camp. Alexandra Heinrich gets some fresh air between lectures on day 3 of the Haiti Entrepreneurship Camp 2014, outside a classroom at Université Quisqueya, Port-au-Prince. Alex is the program coordinator for the camp, and is in charge of managing the core staff’s individual responsibilities and scheduling, among many other tasks. She will also be presenting a training on cost accounting on Monday, June 9th to open week 2 of the camp’s programming. Alex is a project manager for Lufthansa Technik Landing Gear Services in London. She joined the team to pass on her knowledge to those who seek it, in order to fulfill her dream for involvement in the social welfare of people worldwide. Since entering Haiti, she has discovered that she loves eating mangoes, in the traditional Haitian way — with her bare hands and teeth! the role of profitability in a company. the different types of costs and calculating company’s profitability. The topic was popular to the group, the core team decided to return to the topic on Monday with a new guest lecturer. Now we are glad to welcome Robin Balser and Nils Hermann. Robin Balser is the founder of several Startups, he will lecture on “Business Model Canvass”. 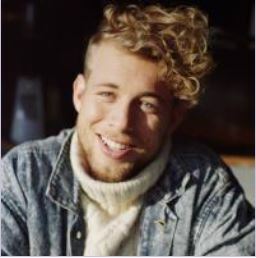 Nils Hermann is the founder of Innovation thinktank and involved in multiple social projects. He will cover the topic of “Corporate Planning”. This entry was posted in Uncategorized on June 4, 2014 by Entrepreneurship Camp. We don’t see poverty, but opportunity. 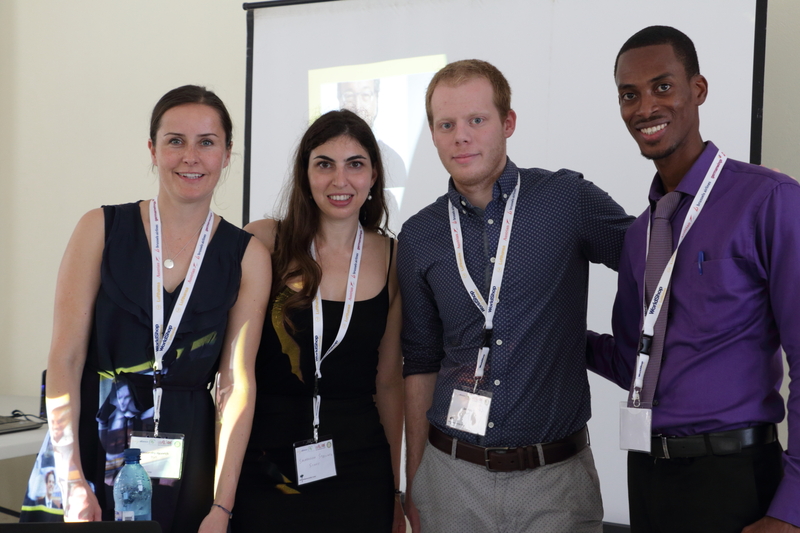 The first day of Haiti Entrepreneurship Camp 2014, a great team from London, Germany, and the USA have joined together with the Haiti team to make a difference by empowering the young Haitian entrepreneurs in starting up and managing their own businesses. 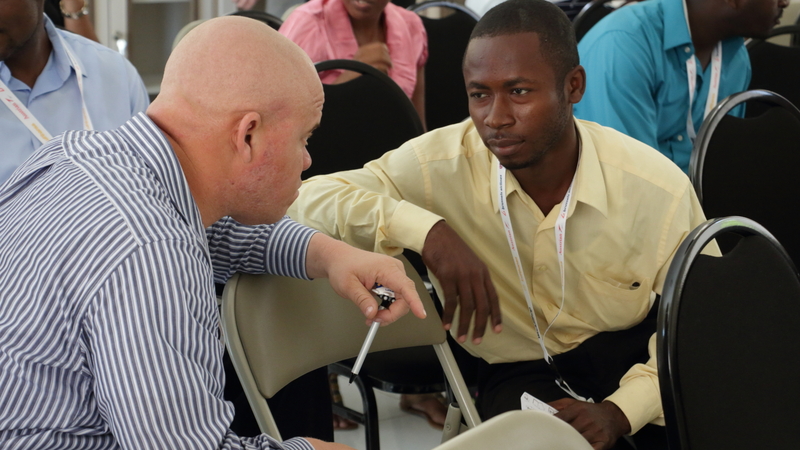 To our great surprise, in the group sessions, the Haitian entrepreneurs brainstormed a lot of creative and innovative business ideas that could positively impact the Haitian economy for the next few years. They do have the willingness to develop, organize and manage a business venture along with any of its risks so the country can make a shift toward sustainable economic development. And there comes the purpose of Haiti Entrepreneurship Camp 2014: empowering and providing them with the skills and confidence they need to get into that journey. We believe that the Haitian people have a lot of potential to accomplish great things. They just need to know how to proceed. Of course Haiti has for a very long time been listed among the poorest countries in the world, but the level of accomplishment of the Haitian people is not determined by how other people see them. It’s determined instead by how they see themselves. Therefore, we want to help them extend their vision just one step further with the eyes of creativity and optimism to see opportunities where everyone else sees poverty. We believe that, if we want to build an economic capital, we must build first a human capital, then the human capital will build the economic capital. 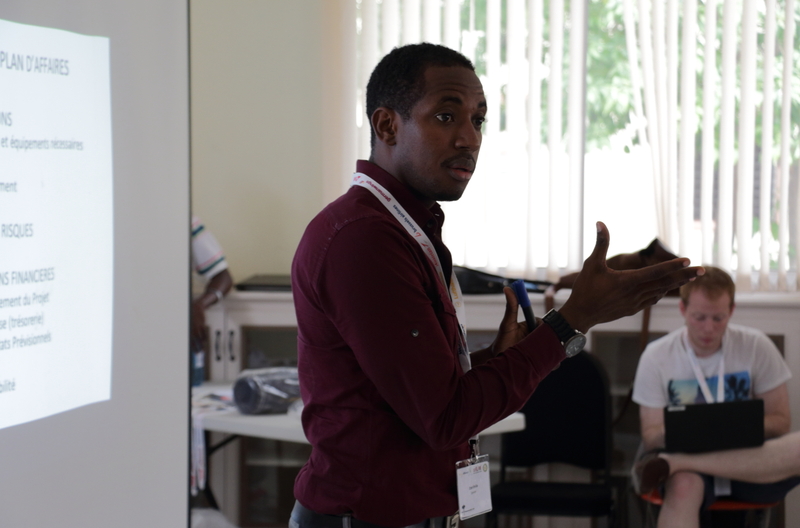 “You are someone special, at a special moment, who’s going to do something special.” That was the motto of the first day of Haiti Entrepreneurship Camp 2014. This entry was posted in Uncategorized on June 3, 2014 by Entrepreneurship Camp. This entry was posted in Uncategorized on May 31, 2014 by Entrepreneurship Camp.